"With RES incentives of 15 c€/kWh, a feed-in-tariff specifically designed for mini-grids, PV electricity would reach grid parity"
This is the main conclusion of a really interesting paper (1) published by the Joint Research Center (JRC) last July. 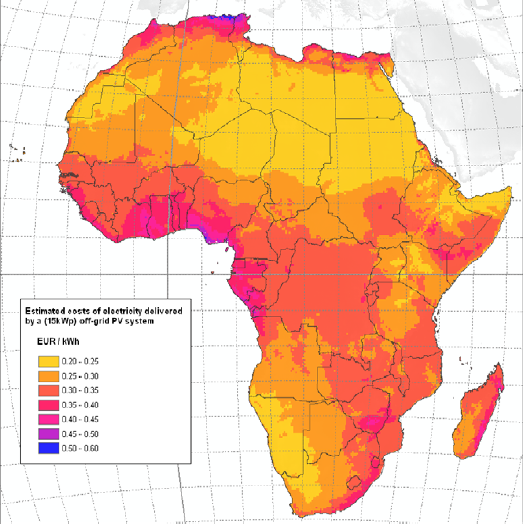 And that would mean that decentralized PV could become economically feasible for those 600 million people that currently have no access to energy services in Africa, even for those living at a reasonable distance from the existing grid. Large geographical differences can be observed since electricity cost from PV mini-grid ranges from 0.2 up to 0.55 c€/kWh. Differences in the connection costs depending on customers located in urban or isolated rural. But perhaps the main one is that only 5 c€ difference in ability to pay would significantly increase the proportion of regions (see fig.3) where PV would be the Least Cost Option. So for large remote areas, where the extension costs would increase the electricity costs by around 10-15 c€/kWh, PV electricity could become competitive with grid electricity. Although it is extremely complicated to collect data from subsidies for grid electricity, for most of the countries it can be placed in the range of 12-18 c€/kWh. Why not subsidize with a similar amount the PV electricity? As explained above, the analysis also reveals the high sensitivity of the decentralized rural electrification systems to the diesel prices. 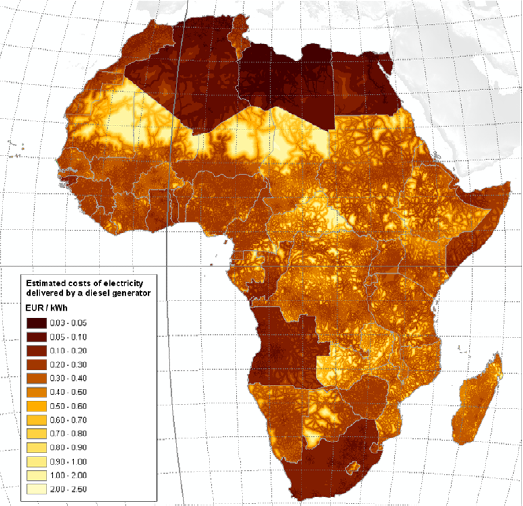 As fuel is often subsidized by certain African governements, why not also consider to support PV (in the form of feed-in-tariff, for example) and thus avoiding to distort the rural electrification markets? This study confirms that renewable energy can and must play an essential role to put the energy to the service of the human development, resulting in a long-term sustainable energy mix that make the access to modern energy services affordable to the BoP. Since the lack of valid information with respect to subsidies and taxes, grid-extension master plans, load profiles and socio-economic data is one of the main barriers, the involmement of regional and national stakeholders is seen as indispensable for country-specific evaluations. S. Szabó, M. Moner-Girona, K. Bodis and T. Huld; "Mapping electrification costs of distributed solar and diesel generation versus grid extension"; JRC and UNEP. 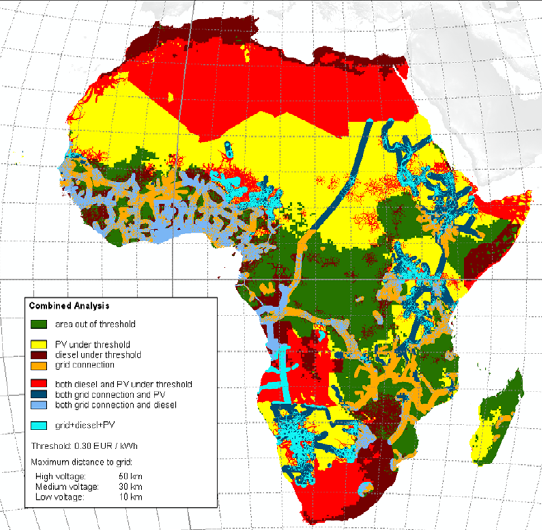 "Renewable Energies in Africa"; JRC Scientific and Technical Reports. "Technical and Economic Assessment of Off-grid, Mini-grid and Grid Electrification Technologies"; ESMAP Technical Paper 121/07. Pico PV: a real solution for rural electrification? This is an open space to share ideas and knowledge, so please feel free to comment any of the entries or simply post a new theme. Your contribution is very welcomed!